listen), German: Marburg an der Drau) is the second-largest city in Slovenia with about 96,000 inhabitants in 2015. It is also the largest city of the traditional region of Lower Styria and the seat of the City Municipality of Maribor. In 1900 the city had a population that was 82.3% Austrian Germans and 17.3% Slovenes (based on the language spoken at home); most of the city's capital and public life was in Austrian German hands. Thus, it was mainly known by its Austrian name Marburg an der Drau. According to the last Austro-Hungarian census in 1910, the city of Maribor and the suburbs Studenci (Brunndorf), Pobrežje (Pobersch), Tezno (Thesen), Radvanje (Rothwein), Krčevina (Kartschowin), and Košaki (Leitersberg) was inhabited by 31,995 Austrian Germans (including German-speaking Jews) and only 6,151 ethnic Slovenes. The surrounding area however was populated almost entirely by Slovenes, although many Austrian Germans lived in smaller towns like Ptuj. During World War I many Slovenes in the Carinthia and Styria were detained on suspicion of being enemies of the Austrian Empire. This led to distrust between Austrian Germans and Slovenes. After the collapse of the Austrian-Hungarian Empire in 1918, Maribor was claimed by both the State of Slovenes, Croats and Serbs and German Austria. On 1 November 1918, a meeting was held by Colonel Anton Holik in the Melje barracks, where it was decided that the German-speaking city should be part of German Austria. Ethnic Slovene Major Rudolf Maister, who was present at the meeting, denounced the decision and organised Slovenian military units that were able to seize control of the city. All Austrian officers and soldiers were disarmed and demobilised to the new German Austria state. The city council then held a secret meeting, where it was decided to do whatever possible to regain Maribor for German Austria. They organised a military unit called the Green Guard (Schutzwehr), and approximately 400 well-armed soldiers of this unit opposed the pro-Slovenian and pro-Yugoslav Major Maister. Slovenian troops surprised and disarmed the Green Guard early in the morning of 23 November. Thereafter, there was no threat to the authority of Rudolf Maister in the city. Many historical structures stand in Maribor. Of the remains of city walls surrounding the old downtown, the most prominent are the Judgment Tower, the Water Tower, and the Jewish Tower. Maribor Cathedral was built in the Gothic style in the 13th century. Maribor Synagogue was built in the 14th century, and is the second oldest synagogue of Europe. Today it serves as a centre for cultural activities. Other prominent Medieval buildings are Maribor Castle, Betnava Castle, and the ruins of Upper Maribor Castle on Pyramid Hill. Town Hall was constructed in the Renaissance style, and the Plague Column in the Baroque style. In 2008, the Studenci Footbridge (Studenška brv) was renovated according to the design of the Ponting company. The same year, at the 3rd International Footbridge Conference in Porto, this design was awarded the prestigious Footbridge Award. Maribor is known for wine and culinary specialities of international and Slovene cuisine (mushroom soup with buckwheat mush, tripe, sour soup, sausages with Sauerkraut, cheese dumplings, apple strudel, special cheese cake called gibanica). There are also many popular restaurants with Serbian cuisine. The Vinag Wine Cellar (Vinagova vinska klet), with the area of 20.000 m2 (215.28 sq ft) and the length of 2 kilometres (1 mi), keeps 5,5 millions litres of wine. 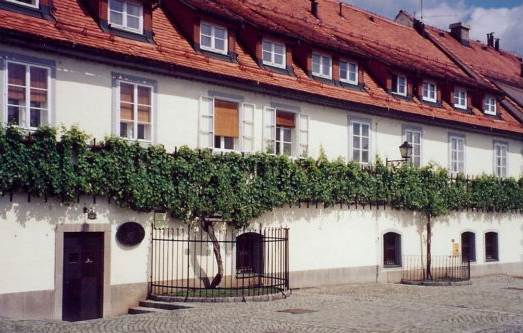 The house of the oldest grapevine in the world (Hiša stare trte) at Lent grows the world's oldest grapevine, which was in 2004 recorded in Guinness World Records. The grapevine of Žametovka is about 440 years old. Maribor is the hometown of the association football club NK Maribor, playing in the Slovenian PrvaLiga league. The club participated in the UEFA Champions League in the 1999–2000 and 2014–15 seasons, and in the UEFA Europa League in the 2011–12, 2012–13 and 2013–14 seasons. NK Maribor plays its home matches at the Ljudski Vrt Stadium in Maribor. Maribor sports parks include Pohorje Adrenaline Park (Adrenalinski park Pohorje) with a high ropes course, one-track-line PohorJET, and summer sledding; Pohorje Bike Park; and Betnava Adventure Park (Pustolovski park Betnava) with ropes courses, zip-lines, and poles. ^ "Nadmorska višina naselij, kjer so sedeži občin [Height above sea level of seats of municipalities]" (in Slovenian, English). Statistical Office of the Republic of Slovenia. 2002. http://www.stat.si/letopis/2002/01_02/01-06-02.asp?jezik=en. ^ a b "Maribor, Maribor". Place Names. Statistical Office of the Republic of Slovenia. http://www.stat.si/KrajevnaImena/eng/default.asp?txtIme=MARIBOR&selNacin=celo&selTip=naselja&ID=2620. Retrieved 31 October 2015. ^ "Castrum Marchburch, 850 let od prve omembe Maribora [Castrum Marchburch, 850 Years Since the First Mention of Maribor]" (in Slovenian). MMC RTV Slovenija. 14 October 2014. http://www.rtvslo.si/kultura/novice/castrum-marchburch-850-let-od-prve-omembe-maribora/348675. ^ "Maribor 2012: Smrt je kosila tudi iz zraka". Zivljenjenadotik.si. http://www.zivljenjenadotik.si/index.php?id=275&tx_ttnews%5Btt_news%5D=3178&cHash=1838e06bd636ba2a9732f225784f6f85. Retrieved 2013-03-26. ^ M.K. (8 May 2015). "Kako so proslavili osvoboditev Maribora in ga znova postavili na noge [How Maribor was liberated and rebuilt]". RTV Slovenija. http://www.rtvslo.si/kultura/razstave/kako-so-proslavili-osvoboditev-maribora-in-ga-znova-postavili-na-noge/364639. Retrieved 12 May 2015. ^ "Zveza mariborskih športnih društev Branik". Zveza-msdbranik.si. 2009-10-13. http://www.zveza-msdbranik.si/vsebina/1/30/Po_2._svetovni_vojni.html. Retrieved 2013-03-26. ^ "Evropska prestolnica mladih" (in Slovenian). Mb2013.si. http://www.mb2013.si/en/. Retrieved 2013-09-02. ^ Kottek, M. (2006). "World Map of the Köppen-Geiger climate classification updated". Meteorol. Z. 15 (3): 259–263. DOI:10.1127/0941-2948/2006/0130. Retrieved on 24 August 2012. ^ "Maribor Climate normals 1981-2010". ARSO. http://meteo.arso.gov.si/uploads/probase/www/climate/table/sl/by_location/maribor/climate-normals_81-10_Maribor.pdf. Retrieved March 15, 2015. ^ "Slovenia-Maribor: Defence Towers". Maribor-pohorje.si. http://maribor-pohorje.si/defence-towers.aspx. Retrieved 2013-03-26. ^ Jewish community of Slovenia Archived January 28, 2010 at the Wayback Machine. ^ "Old vine in Maribor". Maribor-slovenia-travel-guide.com. http://www.maribor-slovenia-travel-guide.com/old-vine-maribor.html. Retrieved 2013-09-02. ^ NK Maribor. "NK Maribor" (in Slovenian). NK Maribor official website. http://www.nkmaribor.com/. Retrieved 2013-09-02. ^ "Official website of Mariborsko Pohorje". Pohorje.org. http://www.pohorje.org/poleti_ENG/. Retrieved 2013-09-02. ^ "Kresanje mnenj o univerzijadi [Clash of Opinions About the Universiade]" (in Slovenian). Delo.si. 19 February 2012. http://www.delo.si/novice/slovenija/kresanje-mnenj-o-univerzijadi.html. ^ "Mariboru odvzeli univerzijado [Universiade Taken Away from Maribor]" (in Slovenian). Slovenske novice. 6 March 2012. http://www.slovenskenovice.si/novice/slovenija/mariboru-odvzeli-univerzijado. ^ a b "Prijateljska in partnerska mesta [Friendly and partner cities]" (in Slovenian). www.maribor.si. http://www.maribor.si/podrocje.aspx?id=1162. Retrieved 4 March 2016. This page uses content from the English language Wikipedia. The original content was at Maribor. The list of authors can be seen in the page history. As with this Familypedia wiki, the content of Wikipedia is available under the Creative Commons License.